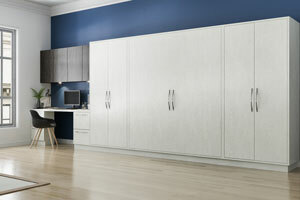 Murphy Beds Murphy Beds come in all sizes and the cabinet possibilities are unlimited. A Murphy bed is an ingenious solution for your extra bedroom, home office, or guest space. Due to its inherent “hideaway” functionality, once the bed is folded up into its cabinet, it frees up floor space allowing the room to instantly become transformed into an office, craft space, exercise room rather than remaining merely a bedroom. 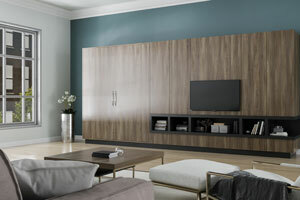 Murphy Beds are a well-known brand that comes in many sizes and are one of the brands Closet Factory offers. They are also frequently referred to as a wall bed; it is a relatively functional mechanism that can morph any room into an instant bedroom. The highlight is that a Murphy bed, or folding bed, usually uses vertical space to store a bed while converting the floor-space into a more useable open area without the apparent intrusion of a bed. These days they are always on trend because they are indeed the ideal addition to any urban micro unit, loft or home where space is a valuable commodity. Murphy beds can be lowered from their hidden vertical position for use each night, snapped back into its original place and tucked away in one quick motion creating a truly multipurpose space. 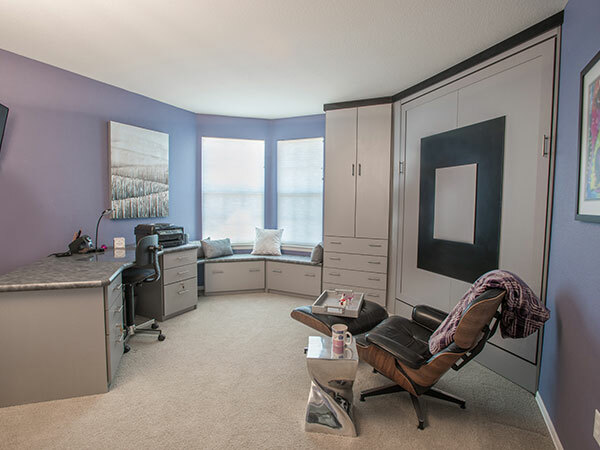 Without the cost or time involved in room additions, homeowners are also able to create multi-functional spaces like home offices that can convert into a quiet resting space for work breaks and an evening siesta. When guests arrive, a Murphy bed can be quickly lowered to create a convenient guest bedroom, and a child’s playroom can soon become a cozy space for nap time. Any room in the home can be converted into a bedroom with the convenience of a wall bed as they indeed allow homeowners to save space without ever compromising the notion of comfort. 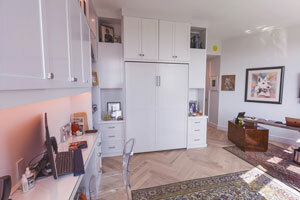 While a Murphy Bed offers flexibility, added cabinetry is used to turn the space into more than just bedroom furniture. You can transform the room into an oasis of peace and relaxation while doing so in a style that blends well with the home’s overall theme or decor. With a wide array of styles to choose from, homeowners can rest assured that their wall bed fits the decor of their home. There are many types of materials, and finishes to choose from to offer character and personality to not only their bed cabinetry and complement the entire space. There’s no need to sacrifice fashion for functionality with a Murphy Bed as they are inherently customizable and designed to fit within the limits of the walls of each room. Additionally, the hideaway capabilities can offer the illusion of a closet or a decorative armoire. Working with a professional designer will help ease the planning process and any nerves. Your designer will help you analyze the space of the room including the dimensions, like the height and width of the wall in question. 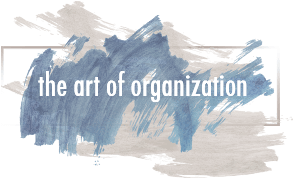 During this process, you’ll determine the purpose of the bedroom and most effective layout – whether it is as an office by day, and a quiet meditation room by night or a multi-functional living room that transforms into a bedroom or flex room. The next priority when designing your Murphy Bed is the size and type of bed you’ll want for the installation. A wall bed can be adjusted to fit any sized bed for a room of any size – it is entirely at your discretion. Do you want a twin, bunk, queen or king-sized beds? Your designer will also advise you on the different types of devices that you may select – whether it is a piston or spring. A piston typically uses air pressure that provides support when raising and lowering the wall bed. Springs usually are the more traditional type and use compressed steel in its functionality concealed within the bed frame. As with most closet and storage organizational systems, there are many styles to choose from including modern and traditional styles. Your designer will help you determine the style that best suits your needs and complements your home. A modern design may integrate desks, tables, and shelving to add multiple purposes to the room. Your designer can offer any Murphy bed option to fit your budget and provide an estimate during a free consultation. During the visit, a professional designer can effectively analyze the space, determine your needs and offer styling options that suit your distinct tastes. The primary goal of the consultation is to develop a plan of action that is affordable and provides a stylish, yet effective wall bed solution that keeps your home smart, organized and comfortable. Colorado designed this octagon room and converted it into a home office and guest room. Window seat creates storage under the windows. Built-in desk area angles out away from the closet. Murphy bed is open to expose a slanted headboard. 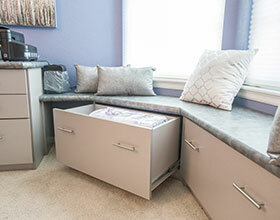 Window seat features large drawers for bedding storage. 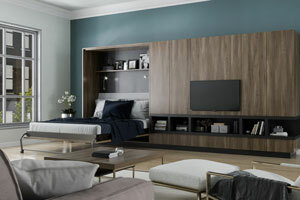 View more Murphy Beds by visiting the wall bed gallery.